Question: What do you mean by International Marketing Environment? Also describe various elements of International Marketing Environment. Steve Jobs was ousted from Apple in 1985 and the company was on the verge of bankruptcy in the early 1990s. But Jobs returned in 1996 to lead the company to unprecedented heights. Today, under CEO Tim Cook, who replaced Jobs in 2011, Apple is now worth $145.3 billion and ranks on top of Forbes’ list of the World’s Most Valuable Brands. Apple is so successful because of their effective marketing efforts. They are good in identifying relevant environmental factors and trends which helps in taking advantage of opportunities and minimising threats. New technological developments, global economic conditions, worldwide population changes, increased competition, legislative requirements, and political events are some of the factors affecting current and future marketing activities of the organisations around the world. Combination of such factors makes the International Marketing Environment. The long term performance of any organisation depends on its ability to identify and respond effectively to the key changes in its marketing environment. The objective of this post is to help you understand - the meaning and nature of International Marketing Environment, and the important elements of International Marketing Environment. International Marketing Environment is the combination of various factors external to an organisation that can affect the international marketing decisions of the organisation in international market. These factors are largely uncontrollable, although marketers can influence some of them. For example, Apple cannot control population trends, economic conditions, or laws once passed, but it can have some influence on relations with stakeholders, technological developments, and competitive situations. International Marketing Environment consists of organization’s internal factors, domestic marketing factors, and global marketing factors. Internal factors are controllable which includes - organisational structure, productivity, relations with stakeholders, organisational policies and rules. 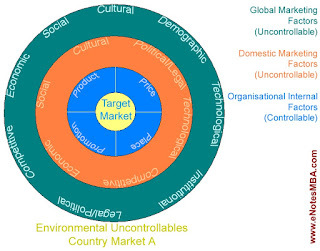 Domestic marketing factors and global marketing factors are uncontrollable. Domestic marketing factors include – availability of raw material, availability of infrastructure, legal system, and technological factors. Global marketing factors are related to the world economy. 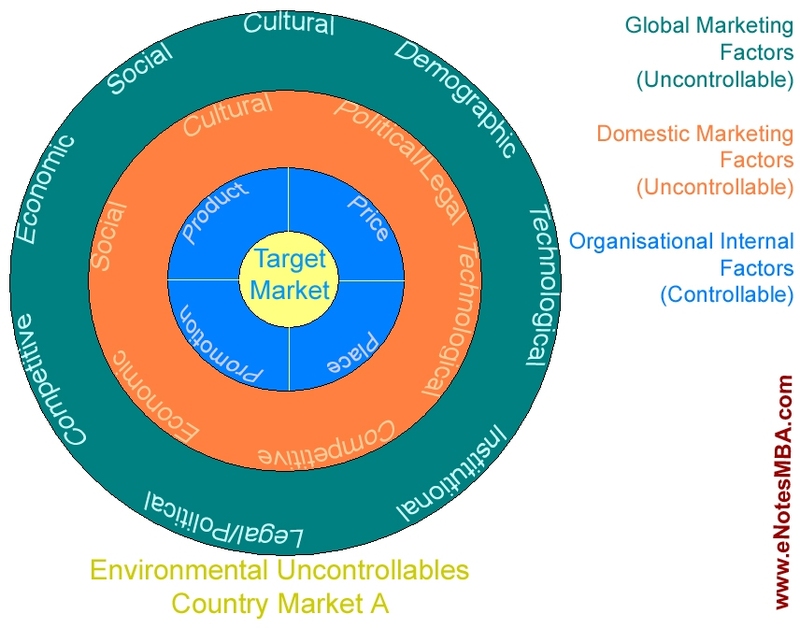 The main global marketing factors are – Political and legal factors, economic factors, social factors, technological factors, demographic factors, cultural factors, competitive factors, and institutional factors. Organisations do environmental scanning to identify important trends and determine if they represent present or future market opportunities or threats. The process of environmental scanning is consisting of identifying relevant environmental factors and trends and assessing their potential impact on the organization’s markets and marketing activities. If the trend creates market opportunity marketers have to take timely decision to take advantage of the opportunity. If the trend poses marketing threat decisions are taken to minimise the threat. Company’s relations with other stakeholders and service providers.